Fresh Ideas & Solutions Inc. is celebrating 20 years in 2019! Our office and warehouse will be closed on Friday April 19th for Good Friday. ​We will be back for regular office and warehouse hours on Monday April 22nd. Please note that we are a consulting firm and as such, our product is information. 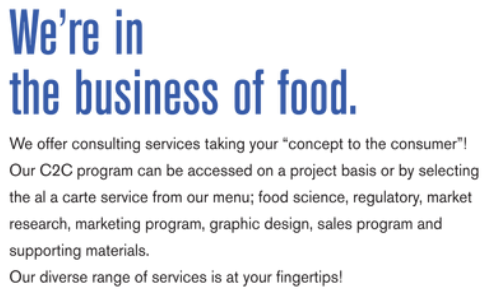 Generally, you are requesting our assistance for our expertise that has been derived from not only professional education but also expertise that has been obtained through years of experience within the food industry. We believe that we provide good value and provide realistic expectations for the investment in your project. Our services are competitively priced within the industry.